Noni fruit contains more than 200 nutraceuticals, vitamins, minerals, alkaloids, amino acids and antioxidants that are required by our body on daily basis. It is powerful detoxifier, removing the toxic residues from our cell membranes, allowing the cell membrane to be soft and supple for effective membrane communication. It is also proved to be a stress reliever and immune system regulator. Morinda Citrifolia works as an adoptogen, making the body systems work to normal levels. Research has shown that Noni contains an enzyme called as Pro-xeronine, which combines the naturally occurring an enzyme called, Pro-xeronese, to produce Xeronine, an alkaloid which is required by every cell of the body to work effectively. Noni has also proved to be powerful pain manager, without any side effects. Noni helps to improve the body's self healing mechanism. It improves digestion and quality of blood in the body. It is a food for the cells. When the cells are healthy, the tissues, organs, body systems and the entire body become healthy. Noni helps to absorb that micro-nutrients from the food we eat, by opening the pores of the cell membrane. Noni fruit has proved to be powerful health enhancer. Noni BioTech Private Ltd is pioneer in presenting the wholesome benefits of Noni fruits through Prof.Peter's Original Divine Noni, available in 15ml pouch and bottles of 50 ml, 100 ml, 200 ml, 400ml, and 800 ml.The Product Prof. Peter’s Original Divine Noni is having vitamins like vitamin C, Vitamin B1, B2, B6, Vitamin E, & minerals like calcium, Sodium, Iron, Copper, Potassium, Manganese, Phosphorus, Zinc etc and active compounds IRIDOID that helps to maintain proper functioning of the body systems. The Original Divine Noni has been formulated from natural herbs for greater health, vitality, and well-being. Morinda citrifolia is used as key ingredient for preparation of Original Divine Noni and it is processed from the Morinda citrifolia fruit grown by organic cultivation method and processed with no fumigants, toxic flavorings. It is a combination of extracts of powerful herbs such as Garcinia cambogia andGlycyrrhiza glabra (Licorice) in addition to Morinda citrifolia. It is processed with high care to maintain its bio-activity and keep its active components intact. NONI fruit contains 160 Neutraceuticals. Original Divine Noni provides the body with the important nutrients; it requires to support general health and well-being. Samples of each batch of Original Divine Noni are tested to verify purity of each bottle and also tested periodically by world’s most reputed and NABL (National Accreditation Board for Testing and Calibration Laboratories). The reports guarantee high quality of the product. Original Divine Noni is backed by ongoing research led by a team of the most committed and experienced scientists and positioned in the fast growing segment of ‘Wellness Industry’. Noni (Noni Garcinia cambogia Mix) a wellness Drink. Noni (Morinda citrifolia.L) fruit contains good quantity of plant IRIDOID. 1) Helps in blood sugar control. 2) Helps to protect the nerves system. 3) It has the cholesterol lowering properties. 4) Helps in production of elastin responsible for youthful and glowing skin with Anti-aging effect. 5) Helps to inhibit the formation of skin cancer, Displays anti-tumor effects on breast, lung, nose and throat cancer. 6) Helps to manage the imbalances and normalize the human body. 7) Helps liver to recover from alcohol and drug damage. 8) Helps to manage the imbalances and normalize the human body. 9) It is a natural remedy to protect from allergies. 10) It acts as an antibiotic whenever required. All the above benefits of IRIDOID have no toxic side effects. Shake well before use. 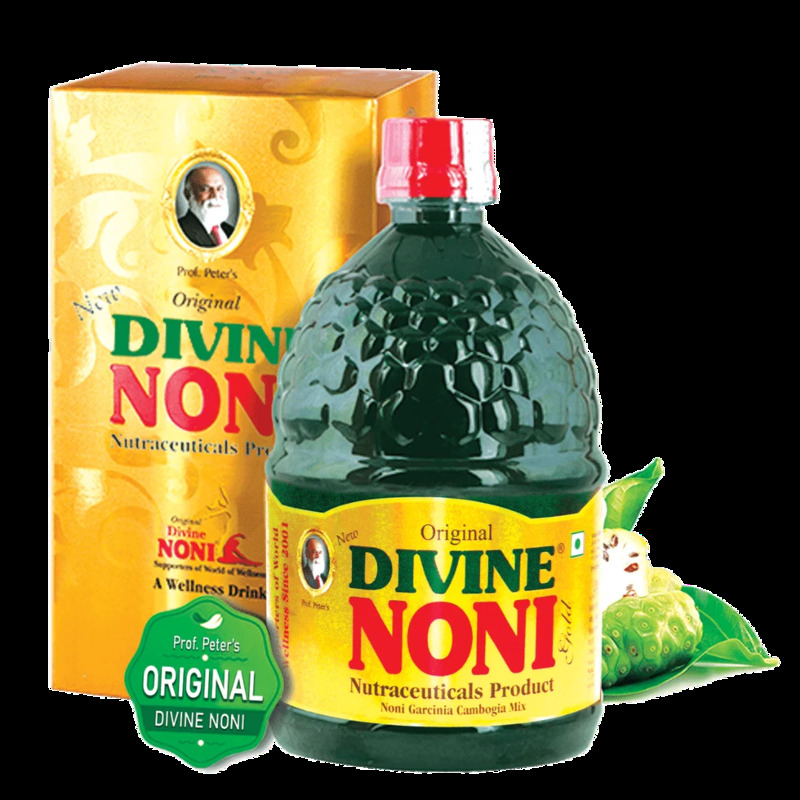 Take the prescribed quantity of Original Divine Noni and add 10 times water. Always Drink Divine Noni on an Empty Stomach, 30 minutes before food.